Caw! Caw! 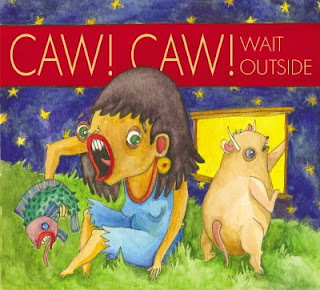 - "Wait Outside"
The members of Chicago indie rock outfit Caw! Caw! have been playing together for years, but just last month released their debut label release, a seven-song EP called "Wait Outside" (Slanty Shanty Records). The band's bizarre name and album art suggest a colorful, experimental sound, and that's exactly what the EP delivers - albeit with basic pop sensibilities tucked quietly underneath, making the entire package easier to digest. Think of a marriage between Radiohead and The Shins with both parties high on Red Bull and you'll get an idea of what this music sounds like. The best and most accessible of the bunch is "Organisms," a bouncy number that most effectively captures Caw! Caw! 's mix of quirky fun and heady artiness. Elsewhere, it wouldn't be out of line to say this stuff drips space rock and shoegaze sensibilities, sounding particularly otherworldly on tracks such as opener "Escape the Red Giant" and "Sheets." This all makes for a mini album that requires a bit of work on the listener's part, but at the same time oozes interesting, well-executed ideas worth hearing. Caw! Caw! is currently on an extensive tour of the country, and will return home to Chicago to play a show at the Abbey Pub on December 11.